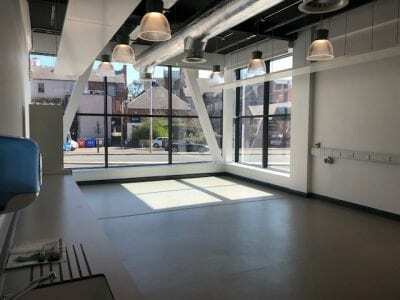 Hope Street Xchange offers 37 new workspaces, comprising offices and creative units to rent in Sunderland for knowledge-led, innovative businesses. The array of offices and creative units on offer can accommodate between two and twelve people, ranging from 15m² / 150 ft² with an average size of 45m² / 450 ft². Contact us for detailed information on sizes and pricing. 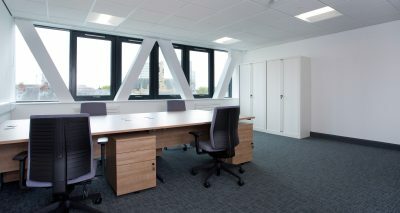 A total of 30 office spaces are available across both the refurbished and new parts of the building. See our interactive maps below for details of room sizes and availability. All workspaces are available on highly flexible easy-in, easy-out terms enabling businesses flexibility to move on or expand their space as their business grows. Offices are accessible at any time of the day or night, allowing you complete freedom to run your business as you require. Seven creative units are provided with concrete load-bearing floors, a sink, pressurised air supply, water supply as well as 3-phase power and can be adapted for a range of uses. Occupiers can rely on cost certainty with a fixed monthly charge. Your rental fees are inclusive of reception services, 24 hour security services and access to meeting rooms. Supplementary services, such as data connectivity, telephony and administrative support can be added on with ease upon request. Occupiers can also benefit from discounted rates for the use of larger meeting and event spaces. A total of 30 office spaces are available across both the refurbished and new parts of the building. Office spaces can be provided furnished or unfurnished with 4 data and 4 power points per 10sqm. All workspaces are provided with individual heat controls and the added security of intruder alarms. Many customisations are available – contact us for details. Seven creative units are provided with concrete load-bearing floors, a sink and water supply as well as 3-phase power and can be adapted for a range of uses. Power and data connections are provided via perimeter trunking. These workshop units have individually metered electricity connections which are billed on individual usage. Contact us for details of availability. Data connectivity is available for occupiers through a fully managed service provided by the University making use of superfast fibre with high levels of resilience. A range of bespoke packages are available for contended bandwidth with the ability to offer scalable dedicated bandwidth for intensive users. Telephony services are available for occupiers through a fully managed service provided by the University of Sunderland. This service includes provision of a premium telephone handset with advanced call-handling features. Hope Street Xchange is designed to be a flexible working location. You can hire a workstation in a shared office on a monthly basis for a fixed fee to include the use of meeting rooms, desk, storage space, data connectivity and a handset. You can also take advantage of one of our virtual office packages at a fixed monthly cost – for details please contact us. Visitor parking can be arranged through reception and businesses can reserve dedicated parking for a fee on a first come, first served basis. For larger conferences and events, further parking can be found in the nearby multi-storey car parks at St Mary’s and Debenhams, both only a few minutes walk from the building. Detailed information and directions can be found here. Disabled parking is also available on site. Hope Street Xchange benefits greatly from a central location with excellent transport links. We are two minutes from the University Metro station, with direct connection to Newcastle International Airport, just down the road from Sunderland’s mainline train station and have a wide range of bus connections nearby, providing your staff and clients with access from across the region and beyond. Hope Street Xchange truly needs to be seen to fully appreciate all that it has to offer. Please get in touch to arrange a visit.